A couple of weeks ago, my son Thomas was helping out with getting the KLONDIKE! team equipment ready by putting a fairly professional grade hot wax job on the sled skis. Thomas was fortunate enough to be a member of several podium-placing Derby teams over the years and even got to Captain the First-Place winning team in 2011… so giving back a little to the teams is actually pretty fun. We were talkin’ KLONDIKE! stuff and Thomas was trying to remember a book he read back in Junior High. It was about a guy who went up north and a Sled Dog Team and their adventures. I suggested “White Fang” by Jack London….NO that wasn’t it… Maybe “Call of the Wild”? No, not that one either. So, Thomas went upstairs and ransacked around his book collection and came back down with “Wood Song” by Gary Paulsen. Yup that was it- possibly his favorite book. He said I should read it; I would like it. And so… I did. I like to read. I have read hundreds of books. And several dozens of them about outdoor adventure. I have lots of favorites. “Wood Song” is now among them. What a great book. Mrs. Maguire is reading it now. In the story, the author sets out to live pretty much off the grid and finds out not only how magical the north country can be, but also how cruel when you make mistakes. And he makes a lot of mistakes. Along the way, he learns, and gets better, and it is most often the sled dogs that teach him the most. The Klondike Derby is that way. In the end – he accomplished his goal, realized his dream, and …well…. just you read the book. So, the February 2017 Boy’s Life Magazine came. I was glad to see it because our new puppy Lucy shredded the January edition and I had not read much of it yet. But the new one had some great stuff and I guarded it from Lucy. Did you read the one about camping the Ookpik Winter Challenge at Northern Tier in Minnesota? 236 hasn’t done that yet but many KLONDIKE!s and certainly Operation Zero at Sabbattis come close! After that article is a story called “Wolf Dreams,” about a boy’s dog sledding adventure. It seemed veeery familiar, but there it was – the author was Gary Paulsen ! Nice job there, Gary! Thanks. But back to the Black River District Klondike Derby… Yes! They did it again! The weather held out and stayed below freezing, so we did not get the mud-fest as feared! It even snowed lightly most of the day for just the right atmosphere. The fresh-waxed skis ran smooth and true over the frozen tundra. I understand former KLONDIKEURS JC Borman and Brian Degen, members of the team that scored the highest total points in the history of the Derby under the leadership of Captain Sam Walczuk in 2013 (11 points shy of perfect), put up a constant badgering…uh, mentoring…and the teams pulled hard. This year was not a perfect run…no…mistakes were made. But not the same mistakes. 2016 was a tough year, and the north country can be cruel…with no 2016 teams on the podium, the ‘17 Eagles had an ax to grind. And Grind they did! 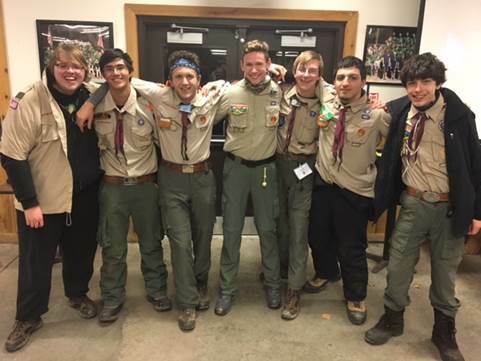 With a perfect score this year at Woods Tools…and Nature…and Sled Inspection…and Scout Spirit…and Winter Camping, led by Captain Seth Hanchett and Co-Captain Alberto Garza-Gomez, they had more than enough First Class Skills and Positive Mental Attitude (and, apparently, dry socks) to best their friends and rivals over at Troop 188… Hoo-rah! Back in 2010, we had a fourth team. Future Superhero Sam Walczuk volunteered to lead the all-rookie crew on their first Klondike. He named them the Iron Soldiers and they came in 19th out of 44 Sleds! And by 2015, the Iron Soldiers had even more iron in their blood and were aiming at the top. A new, mostly-rookie team was formed and became the Arctic Beavers. In ’15 the Soldiers finished in 4th, just a few points behind the Eagles on the podium in 3rd! The new Arctic Beavers? Well, they came in 13th… A top 15 spot for the rookie team! And this year? 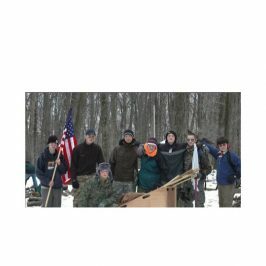 Well as it turns out, the Beavers and the Soldiers both struggled to keep their fires lit and measure the width of the icy river, but they persevered, and most interestingly, the Beavers gnawed past the Soldiers into 12th place under the leadership of Captain Anthony Rocco and Co-Captain Scotty Mitchell. A new Troop record for an all-rookie team! The Soldiers claim to fame this year – Captain Evan Collins and Co-Captain Hudson McFarland – led the only team in the whole Derby to score a perfect 100 at First Aid. Nice work lads! A fine job, all. AND of course, many thanks to all the Adults, who came, and camped, and cheered, and manned the station. Ronnie and Rob Maier – who crafted, cooked and served the finest Hungarian Goulash in all of the Yukon, to keep us warm and happy, plus not to mention deluxe mountain man breakfast burritos – yeah that’s what I’m talking about. Quartermaster to the stars, Eric Degen who, once again, made sure the Troop equipment did not let us down. Rich Romaine – who towed that beauty of a show trailer out and back. Tonight (02/07/17), at the Leaders Round Table, at which they will announce the official results and hand out well-deserved prizes…the Senior Patrol Leaders and I will beam with pride.